​Since NDHU began receiving assistance and support from the Ministry of Science and Technology in 2017, NDHU President Han-chieh Chao Ph.d has been working together with the faculty from our university’s eight colleges to create a transdisciplinary educational program.The Vertically Integrated Projects Program (VIP), which is being implemented by prominent universities throughout the United States, was introduced and has culminated in the establishment of theSmart Technology πPBL Transdisciplinary Program. This Program focuses on cultivating the transdisciplinary talents needed for the emerging smart technology industry and will equip students with the skills and knowledge necessary to gain a competitive edge in job market, providing the professional talent to fuel our nation’s focus on the smart technology industry for future economic development. NDHU hosted the first Conference (2018 International VIP Conference), which commenced on January 8, 2018 and lasted for one week. We invited Prof. Hale Kim from Inha University from South Korea to lead a team of 22 students who had been working on transdisciplinary projects. At the Conference, our universities exchanged experiences on transdisciplinary project education and implementation, signed a student exchange program agreement, and established the content for a cross-national education and research cooperation agreement. As part of the Conference, we also held the Smart Technology Transdisciplinary Applications and Implementation Exchange Achievements and Transdisciplinary Conference. 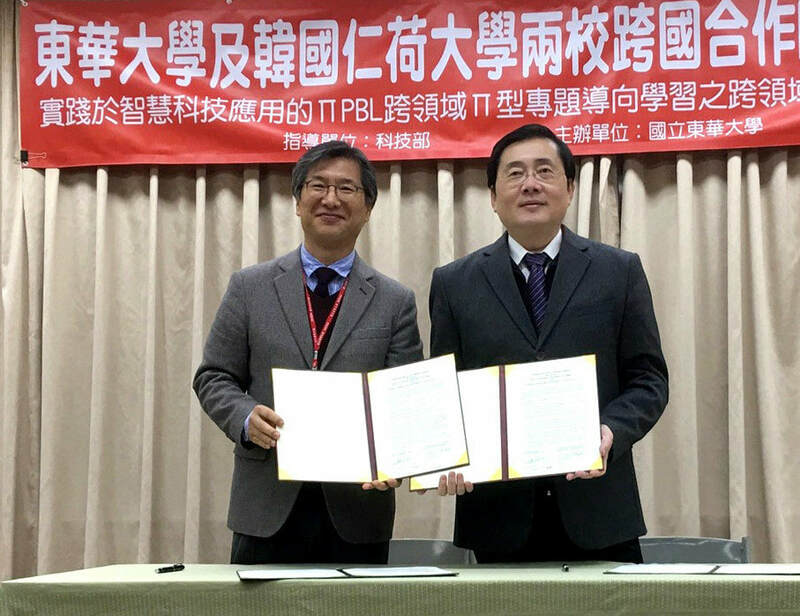 At this Conference, NDHU President Han-chieh Chao and Inha University Prof. Hale Kim signed an MOU for a joint teaching and research cooperation plan and exchange student program, as we looked forward to it serving as a prelude to unveiling future transdisciplinary talent cultivation and an exchange student program between the two universities. The special topic project and poster competition portion of the 2018 International VIP Conference was held for a two-day period and commenced on January 11, 2018. For the special topic project competition, five teams who had participated in the transdiciplinary project program with the best projects were selected to participate from both NDHU and Inha University. And there were a total of 16 teams participating in the poster competition.